← HP Spectre x2 (2017): The Surface Pro Killer? This weekend, I tried an experiment. Given, it wasn’t that important of an experiment and I admit to being bored as hell. But I took my SIM card out of my Galaxy S8+ and put it in my old (less than 2 years really) Galaxy Note 5. I wanted to write some handwritten notes for an interview and thought that since the Note 5 was updated with the the latest version of Android (Version 7, Nougat), I wouldn’t miss my S8+ much. Boy was I wrong. 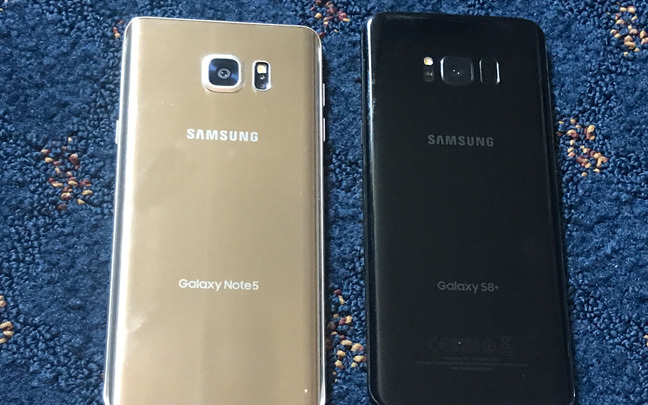 The Galaxy Note 5 is the most recent Note device that’s on the market due to the Note 7 being recalled. 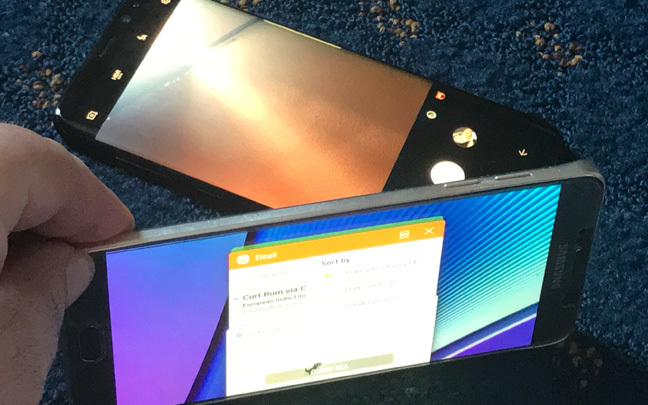 The Note 7 was the perfect smartphone, but it doesn’t help to dwell on what could have been had the device gone under stricter quality control checks. 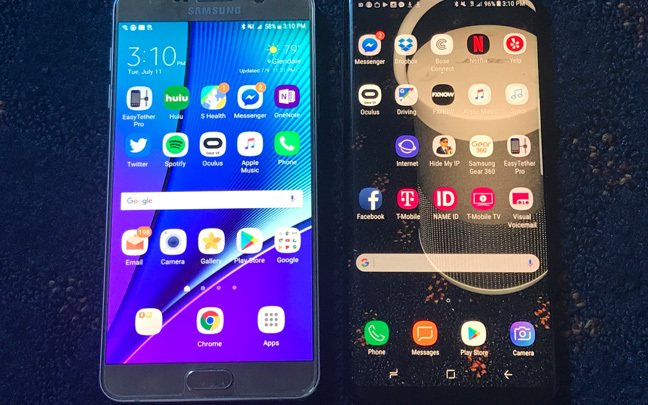 Even though the Note 5 has the same screen size (5.7-inches) and pixel density (1440 x 2560 pixels) as the Note 7, the Note 5 feels less solid, and the screen edges don’t curve like they do on the Note 7. Since the Note 7 doesn’t exist anymore (except for refurbished units in some countries), I’ll stick to comparing the experience of using the Note 5 to that of Galaxy S8+. The biggest difference is speed. Using the Note 5 feels really slow after using the Galaxy S8+, especially when using the Chrome browser. Pages load up to 20 percent faster using the same T-Mobile LTE network on the S8+. Not only that, but scrolling is a lot smoother on the Galaxy S8+, whereas it is somewhat choppy on the Galaxy Note 7. Both the Note 5 and Galaxy S8+ only have monaural sound, but the speaker on the Galaxy S8+ has a fuller and more vibrant sound than the tinny Note 5 does. The speakerphone feature on the Galaxy S8+ also works better, although using both devices as a regular phone reveals the same sound. The 16MP rear camera on the Galaxy Note 5 was certainly the best of its time, but pictures taken in lower-lit situations look rather reductive when compared to the 12MP Galaxy S8+ camera. Remember, megapixels don’t mean everything, and the fact that the Galaxy S8+ has less megapixels prove this. The Galaxy S8+ camera is the best one on the market next to the dual-lens camera of the iPhone 7 Plus. The Samsung Galaxy Note 5 was a great phone for its time. But one has to remember that one year in smartphone time feels like 100 years in the real world due to all the advancements being made. If you really miss the S Pen and think going back to the Galaxy Note 5 will fulfill your needs, you are making a huge mistake. It’s best to wait another month or two for the Galaxy Note 8. This entry was posted in Video and tagged Galaxy Note 5, Galaxy Note 8, Galaxy S8. Bookmark the permalink.